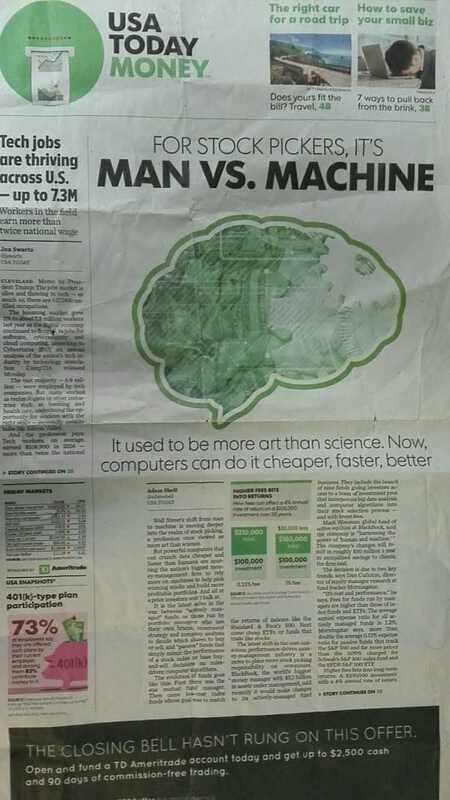 Wall Street’s shift from man to machine is movingdeeper into the realm of stock picking, a profession once viewed as more artthan science. But powerful computers that can crunch data cheaperand faster than humans are spurring the nation’s biggest money management firmto rely more on machines to help pick winning stocks and build more profitableportfolios. And all at a price investors won’t balk at. It is the latest salvo in the war between “activelymanaged” funds, or those run by portfolio managers who use their own brains,investment strategy and company analysis to decide which shares to buy or sell,and “passive” funds that simply mimic the performance of a stock index or basebuy-and-sell decisions on rules-driven computer algorithms. The evolution of funds goes like this: First therewas the star mutual fund manager. Then came low-cost index funds whose goal wasto match the returns of indexes like the Standard & Poor’s 500. Next camecheap ETFs, or funds that trade like stocks. The latest shift in the cost-conscious,performance-driven money management industry is a move to place more stockpicking responsibility on computers. BlackRock, the world’s biggest moneymanager with $5.1 billion in assets under management, said recently it wouldmake changes to its actively-managed fund business. They include the launch ofnine funds giving investors access to a team of investment pros thatincorporate big data analysis and computer algorithms into their stockselection process -- and with lower fees. Mark Wiseman, global head of active equities atBlackRock, said the company is “harnessing the power of ‘human and machine.’”The company's changes will result in roughly $30 million a year in annualizedsavings to clients, the firm said. The decision is due to two key trends, says DanCulloton, director of equity manager research at fund tracker Morningstar. “It’s cost and performance,” he says. Fees forfunds run by managers are higher than those of index funds and ETFs. Theaverage annual expense ratio for all actively managed funds is 1.2%,Morningstar says, more than double the average 0.51% expense ratio for passivefunds that track the S&P 500 and far more pricey than the 0.09% charged forSchwab's S&P 500 index fund and the SPDR S&P 500 ETF. 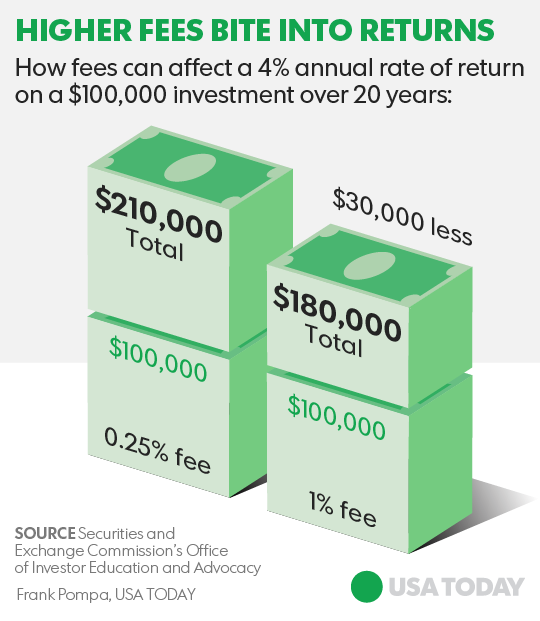 Higher fees bite into long-term returns. A $100,000investment with a 4% annual rate of return and an ongoing fee of 0.25% would beworth nearly $210,000 in 20 years, according to the Securities and ExchangeCommission’s Office of Investor Education and Advocacy. By contrast, if theinvestor paid 1% each year in fees, the portfolio would be worth about$180,000, or $30,000 less, two decades later. What’s more, returns from funds run by stockpickers have badly lagged the benchmark indexes they are measured against foryears. Nearly 70% of mutual fund managers that run U.S. equity funds did notbeat their benchmark in the past year, and that number rises to more than 83%in the past five years, Morningstar data show. BlackRock has not been immune tothe difficulty faced by other actively managed funds. “They’ve long struggledto build a competitive lineup of equity funds,” Culloton says. Traditional fund managers, Culloton explains,incorporate technology into their investment process, but most often come upwith stock ideas by dialing into earnings calls led by executives, or readingtheir transcripts. They also scour regulatory filings or meet with a company’ssuppliers or customers. The old-school fund manager was more like “a greeneyeshade-wearing accountant sitting at a desk crunching numbers or the privateinvestigator out gathering information in order to come up with a betterunderstanding of a stock, or a better piece of information that others on WallStreet don’t see,” Culloton says. By contrast, he says, computer-driven investmentmethods “sweep in everything” to improve stock-picking performance. They use “satellite imagery” to see how manyshoppers are parked outside stores or how many ships are squeezing into ports,or how full grain silos or gas storage tanks are. They use “electronicscraping” techniques to search through transcripts of corporate conferencecalls for words that denote positive or negative outlooks. They can plug insocial media. And while BlackRock is an early leader in thatarea, Neal Epstein, VP and senior credit officer at Moody’s, expects"other firms will feel pressure to follow them." Analysts stress that human money managers are notin danger of extinction. But they say it is likely that more stock funds in thefuture will be hybrid in nature, as investment firms merge the best of bothcomputer-driven strategies and human portfolio. The marriage of computer-driven strategies withmore traditionally run mutual funds could expand the list of funds investorscan choose from.